1. In a bowl, mix mango pulp, condensed milk and whipped cream. Whisk/Mix it lighly till the ingredients mix well. 2. Transfer it to a container in which you want to freeze the ice-cream(should be air-tight container). 3. Freeze it for an hour. 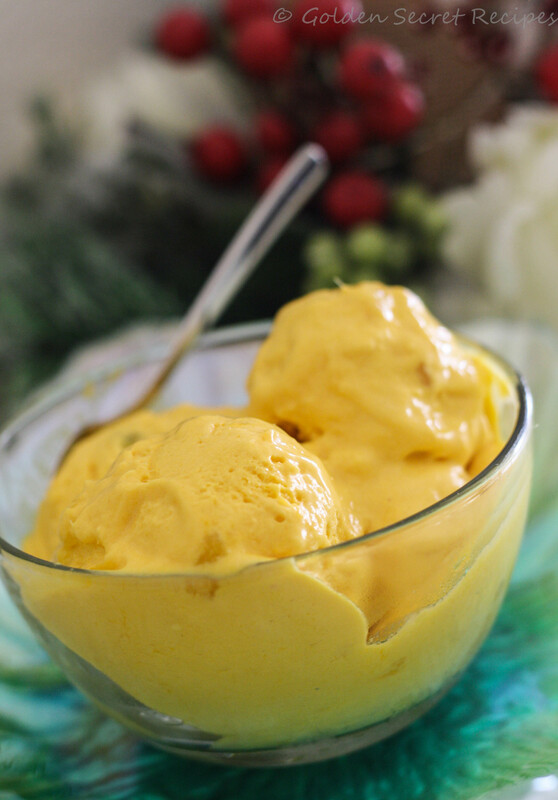 Put the mango cubes into the ice-cream mix and give a light stir. Note: Skip this step if you are not using mango pieces. 4. Continue for freeze for 3-4 hours before serving. Banana bread or Banana loaf has always been one of those things, which I would only buy and NOT make. Reason: Coz I didn’t know its so easy to make one 😛 After I made it once, which was like 3 weeks back, I have already made it thrice!!! I love the texture of the bread and the crunch that is added by the walnuts. DD and few of my friends also liked it a lot. Especially because it wasn’t super sweet and sounds healthy – Banana and Walnuts 😉 !*%$#@! Hehe..
2. Peel the banana and in a bowl, mash them well using a fork and keep aside. 3. Mix baking soda and all purpose flour. 4. In a mixing bowl, beat egg and melted butter well. Then mix in the sugar, salt, vanilla extract, yogurt and olive oil. 5. Add all purpose flour and mix well. Then take the mashed banana kept aside and stir in with the mix. 6. Roughly chop the walnuts, add it to the bread batter and give a stir so that it is evenly distributed. 7. Prepare the loaf pan by greasing it with some butter/oil and then adding little flour so that the loaf/bread doesn’t stick to the pan. 8. Pour the bread batter into the loaf pan and bake it for about 1 hour – 1 hour 10 mins. You would know that the bread is ready, when a knife/tooth pick inserted into the center of the bread, comes out clean. 9. Once the bread is ready, let it cool before you slice them. Please note, this is an important step. Else you would not be able to slice it smoothly. Note: Please don’t stir/mix the banana too much into the batter, else the loaf would become dry and crumbly. Moong Dal Halwa, also known as Asoka Halwa is one of those desserts which I didn’t know existed 😉 Recently, a colleague of mine introduced this dish during our lunch time. It looked like Kesri, but didn’t taste so. That is when she told that it is Asoka halwa and is made of moong dal/split green gram. Well, from that day I wanted to try making this delicious halwa. 1. Heat 1 tbsp of ghee in a saucepan. Roast the moong dal till the raw smell goes off. 2. In a cooker, cook the dal using approx. 1-1.5 cups water. The dal should cook really well. If it doesn’t become a paste, then grind it in a blender to make it a smooth paste. 3. In the saucepan, roast wheat flour and keep aside. 4. Now add the cooked and mashed moong dal to saucepan along with sugar. Stir well so that the sugar melts and mixes well with moong dal. 5. Add the remaining ghee, cardamom powder, roasted wheat flour and food color(mixed in 1 tbsp water). Mix it well and keep stirring. 6. Halwa is ready when the mixture stops sticking to the pan and takes a soft texture. At this time remove from heat. 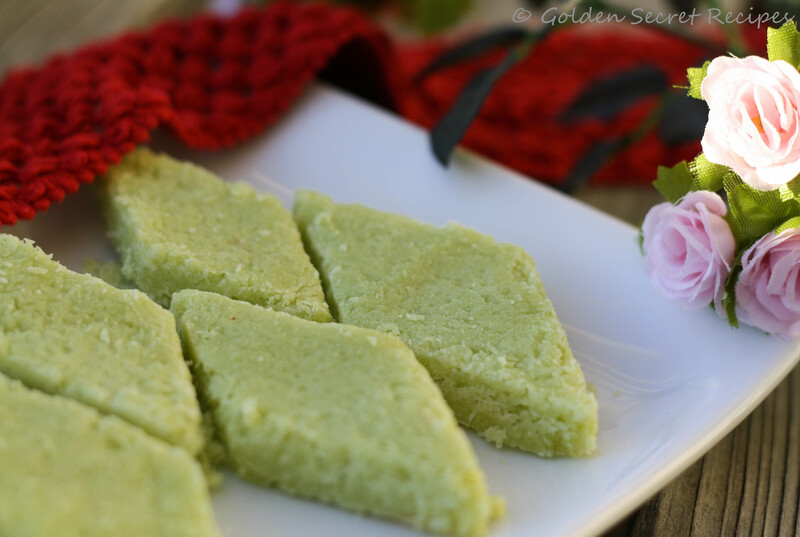 Kesari or Rava halwa as we call it in our homes, is one of the most common sweets made in most Indian homes. I hadn’t made it in quite some time at home. But when you go to South Indian restaurants and order thali, mostly the dessert served would be Kesari. 1. Heat ghee in a saucepan and lightly roast sooji/semolina. 2. Meanwhile heat the water in microwave, ready to be poured into the saucepan once the semolina is roasted. 3. Pour the hot water slowly into the saucepan and keep stirring well so that semolina doesn’t form lumps. 4. Add food color, sugar and cardamom powder and mix it well. 5. Continue to stir and be careful as the semolina mix can splutter. Keep stirring till rava cooks well. 6. Once the sugar melts and the rava doesn’t stick to your hands/fingers/pan anymore, remove it from stove. 7. Transfer it to a greased flat plate and give the Semolina halwa/Kesri the shape you desire. Using a knife draw diagonal lines to make it diamond shaped. You will find many variations in its cooking style. Some people use sesame seeds and fried coconut slices in the recipe. But I personally don’t like to disturb the softness of unni appam and so I don’t prefer the coconut slices in it. 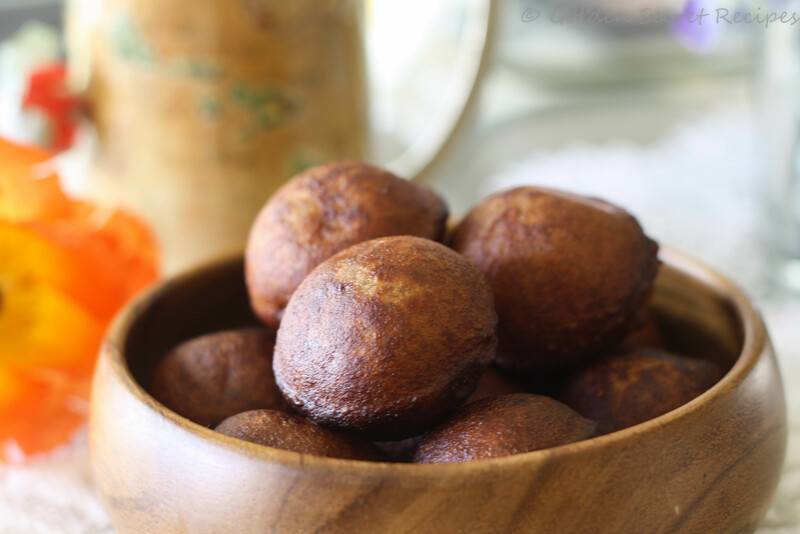 I have made a very simple version of unni appam and it came out well the second time. The first time I made it, I didn’t use all-purpose flour. So it turned out a little hard. I personally don’t like to add baking soda in any of the deep frying items because it results in too much of oil absorption. The reason I mentioned baking soda is because, to soften the unni appam and for it to rise well, some people use baking soda. Instead I used very little all-purpose flour and it was perfect. 1. 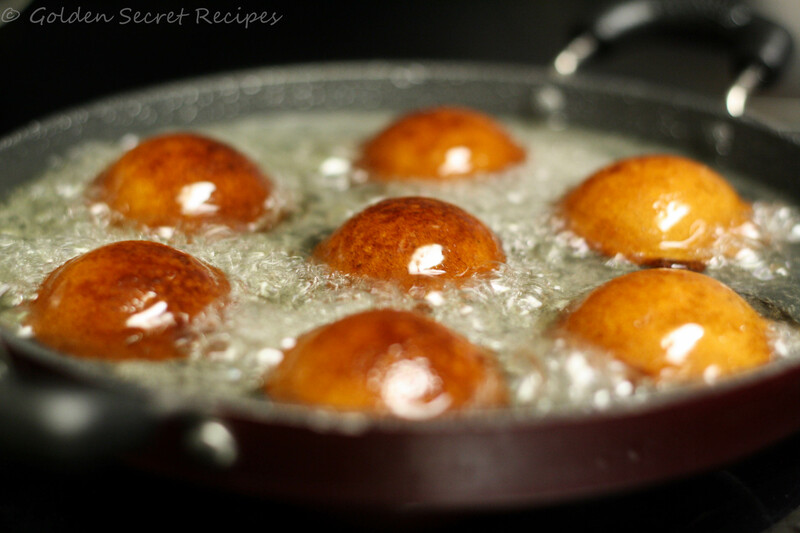 Melt jaggery in a pan using 1 cup of water. 2. Grind the palayankodan(banana) into a smooth paste using a mixie/blender. The banana should be fully ripe. 3. In a bowl, mix all the remaining ingredients. To this add melted jaggery and ground banana. Good a good mix so that the ingredients blend well together(use a mixie if needed. I used just a whisk). 4. The batter shouldn’t be very watery. It will drink lot of oil if it is too watery. But you should be able to drop a spoonful of batter easily to the oil. 5. Keep the batter aside for atleast 4-5 hours. 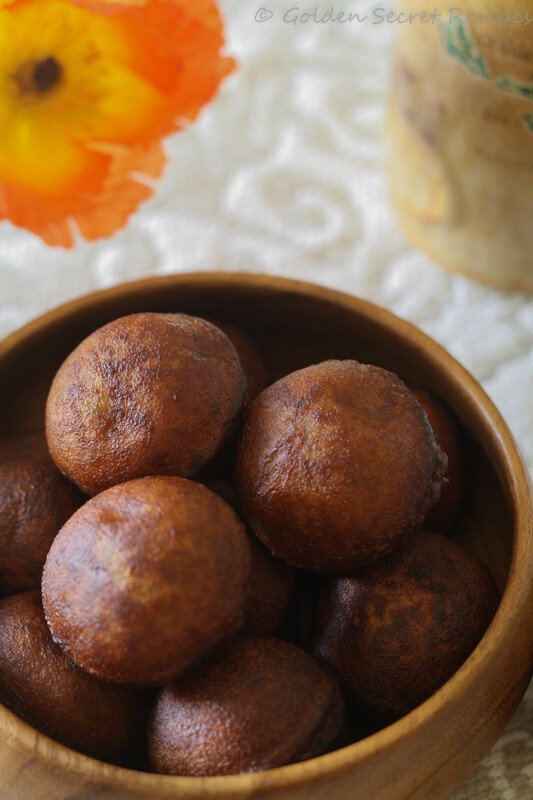 For best results, prepare the batter 1 day prior to making the unni appams. 6. Heat oil/ghee in unni appa chatti(shown in the pic above). Drop a spoonful of batter into each hole(of the pan). 7. Let it fry in medium/medium high flame. Turn around the unni appams when one side cooks, for it to cook evenly on both sides. You would know that the unni appams are ready, when they turn brown. Take them out using either fork or skewer. 8. Drain the excess oil/ghee by placing the unni appams on a paper towel. So here it is. 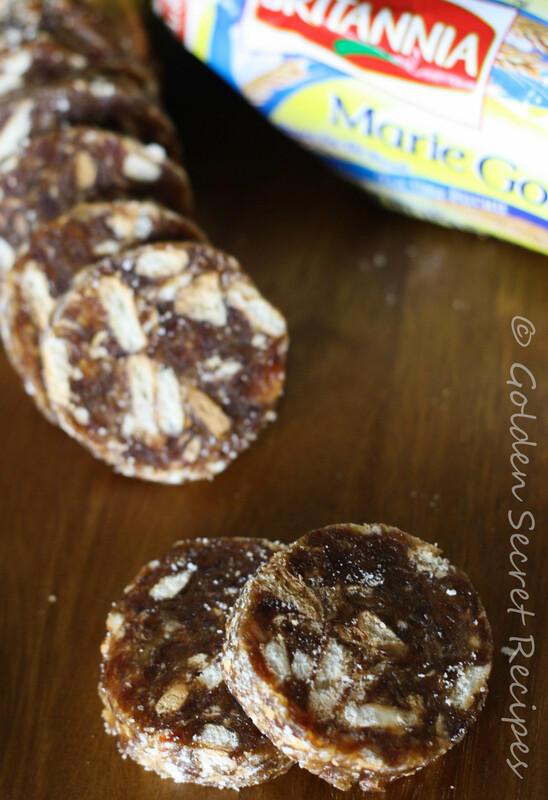 Date roll, one of the healthiest snack you could feed your kids with. Its made into a nice form and bite size pieces, so kids are going to love it. And if you think about the time you spend on it, its a real treat to have. Overall, it took 10 mins of my time to make it 🙂 Personally, I really liked the crunchiness of the crackers/biscuits while it still had all the softness that the dates had to provide. 1. In a blender/food processor, pulse the dates for few seconds such that the dates are chopped finely. 2. Transfer it to a bowl. Mix the ghee with the dates and knead the dates with your hands till it combines well. 3. Place it covered for about an hour. The dates will become soft then. 4. 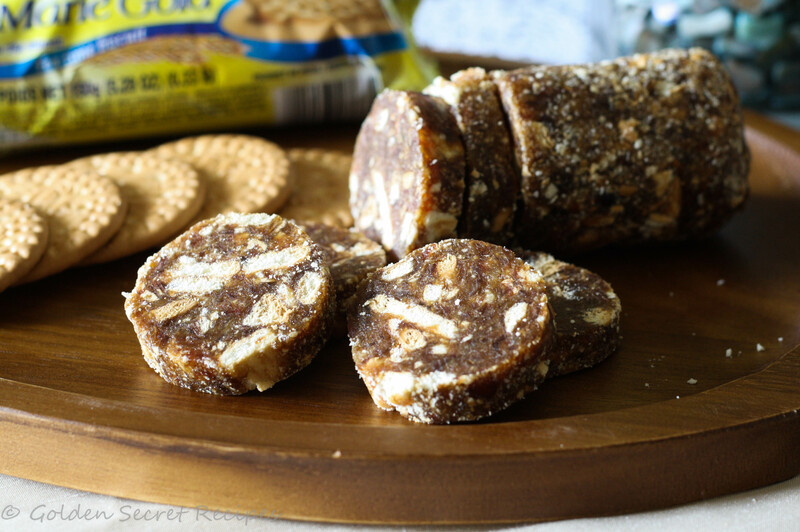 Break the crackers/ Marie gold biscuits into small pieces(you could use pestle and mortar). 5. After an hour, mix these broken biscuits to the date and mix it well with the dates. Try to make the biscuits spread evenly to the kneaded date ball. 6. Divide the ball into halves. Using hands, roll out the ball to form a cylindrical roll. Give it a good and flat shape at the ends. 7. Cover in a cheesecloth and refrigerate for couple of hours so that the roll is set properly. That very day, I decided to make this dessert. Once I made it and tasted it, ah, that taste..I could easily tell that this is exactly how mom used to make it. It was just the ditto taste and look. I was soo thrilled!! I gave it to DD and he was like, “Oh, these things can be made at home too? ?” Well, I couldn’t be happier 😀 Then he gave his best rating for this dish and that took my level of satisfaction a level higher. It is an easy dessert to make at home and super tasty. 1. Take a flat plate/flat tray in which you can set and spread the burfi once its ready. Grease it with ghee/butter. Keep aside. 2. In a saucepan, add coconut, sugar and milk. Mix them well and cook in medium high flame. 3. Once the mixture starts to thicken, reduce the flame to medium and stir continuously. 4. Mix the food color in 2 tbsp water. 5. Slowly pour the color and vanilla extract into the mixture and mix well so that it spreads evenly. 6. The burfi is ready to be removed from stove once it is thick/dry enough so that when you take the mixture into your hands, it shouldn’t stick to your hands. At the same time, you should be able to give it your desired shape. 7. Once it reaches the right consistency(as mentioned in the previous step), remove from stove and spread it evenly on the greased tray/plate. 8. Try and make it as even as possible. You could use another flat pan/vessel to press it and make the surface even and smooth. 9. 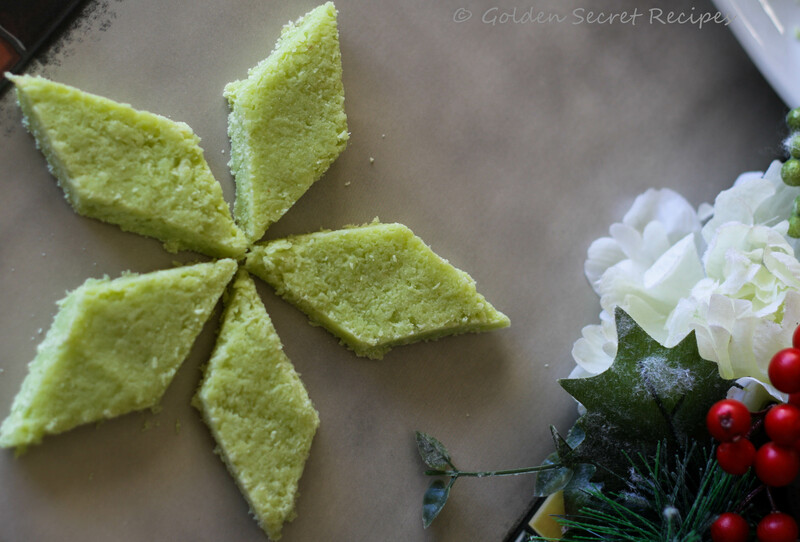 Then using a knife, slice/mark the coconut burfi into the desired shape. Marking/Cutting at this stage is important, else the burfi will harden and then you will not be able to cut it properly. You could cut it into square/diamond pieces. Then allow it to rest for an hour or so. 10. Take one slice from the edge and the other pieces will come off easily.